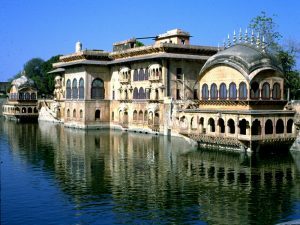 Deeg Palace – 32 kms North of Bharatpur is this beautiful garden town, the gardens have been laid with great care and precision, the sparkling fountains and meticulous palaces add to the beauty of this idyllic retreat. It was the first capital of the Bharatpur state. Now it is renowned for its coloured fountains which are operational twice a year only. People come in from all over to see them.